Roberto Castellanos has the hands of a construction worker and the homework of a 6th grader. Roberto, who just turned 12, spends eight hours a day at a repair shop, sanding and painting ice cream carts for the daily pay of $2.50 in Honduran lempiras. When classes resume after the Christmas holidays, he says, he will cut back to five hours at the shop so that he can go to school in the afternoon and, hopefully, still have time to play soccer on the weekend. "My life is organized. I work in the day and study at night," Roberto says. 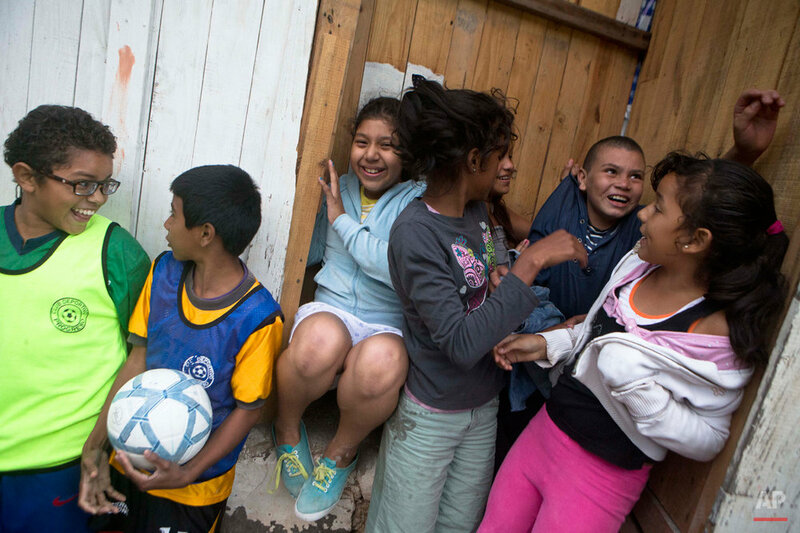 Wise beyond his years, Roberto says he knows that many people consider child labor to be exploitation, but he sees it as opportunity — a means to survive the gang-controlled capital of a country with the world's highest homicide rate. "Here, every day that passes is another day I am alive," Roberto says. His view is shaped by experience, having already seen five people murdered, and is shared by friends who wish they had Roberto's job to help support their families. 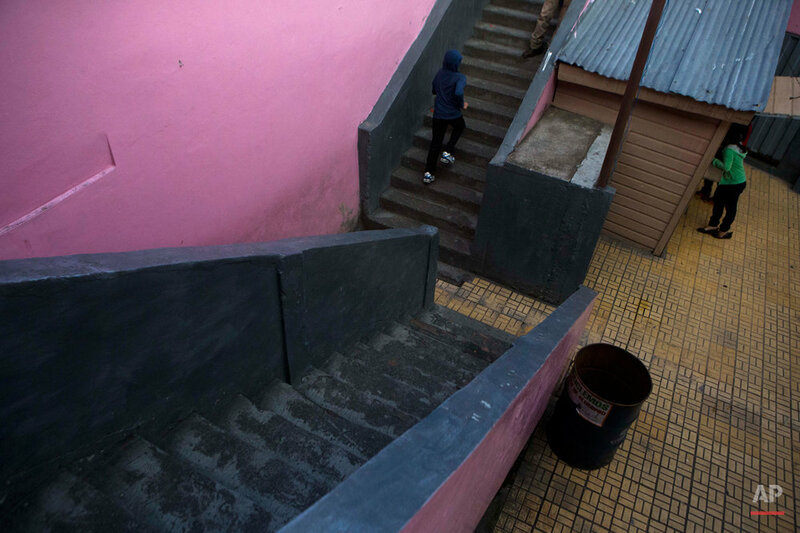 The alternative, they say, is less food at home and an idleness that makes them easy prey for street gangs that control much of Tegucigalpa, the capital of Honduras. Despite international laws prohibiting child labor, about 144 million children between the ages of 5 and 15 go to work around the world, a majority of them in agriculture, says the International Labor Organization. In Honduras, an estimated 500,000 kids hold jobs — about 15 percent of the youth population, according to the National Institute of Statistics. Children can be seen around Tegucigalpa picking through garbage for anything of value, filling bags of sand to sell, unloading trucks in the central market, peddling gum and cigarettes. Still others make their money by selling drugs and collecting extortion money for the gangs. Like Roberto, nearly all working children earn less than the legal minimum wage of $380 a month, as do about 40 percent of adults. Yet Roberto considers himself lucky, because he earns more than most kids he knows. Every year the ILO celebrates World Day Against Child Labor to draw attention to the human rights of children, promote compulsory education and the eradication of child labor. But even those charged with protecting children's welfare say that the reality of poverty in Honduras turns traditional views on child labor on its head. "Children need to support their families and themselves, and escape from the gangs," said Hector Espinal, the spokesman for UNICEF in Honduras. "You can prohibit child labor, but if the state does not take care of families, there is no option for the children but to work." And when a child has to choose between work and school, Espinal said, "the reality is, they pick work." Roberto is among the few who manage both. His friend and soccer mate, Marvin Silva, 14, passes by the shop to watch him sand the sides of the carts, without a mask against the grainy dust, and paint pieces of wood. Marvin hopes that he, too, will get hired. "There are a lot of kids and little work," says Marvin, who sells his mother's tamales outside of city's biggest high school. "I would work here if I could." The dusty Country Gardens neighborhood where Roberto lives and labors is neither in the country nor in sight of a public garden. It is, however, adjacent to a private golf course, and Roberto collects the hard white balls that punch through the aluminum roof of his family's clapboard house. Unlike many of his friends, Roberto lives with both parents — a father who works as a bricklayer's assistant, and a mother who sells tortillas. His parents didn't ask Roberto to get a job, but they are proud of his hard work and appreciate his contribution to the family. Roberto's curved biceps and calloused hands are the result of his previous job in construction. About six months ago, Fernando Saravia gave in to Roberto's persistent appeals and offered him a job in the workshop. After his mother checked out the shop and met the boss, Roberto accepted. "It's better to be here working, learning what things cost in life, than out roaming the streets with nothing to do," Saravia says as Roberto nods in assent. Roberto's soccer coach, Luis Perez, understands this logic, but laments the reality facing all of the kids drawn to his soccer program from impoverished neighborhoods. "Rich or poor, Honduran or American, life has its stages and childhood is not the time for work," said Perez. The problem for many poor and working children, says Ainhoa Intxausti, a social worker with the non-profit World Vision, is that children cannot afford school. Even public schooling is luxury in the second poorest country of the continent, a country where two-thirds of the population lives on $2.50 a day and 25 percent of children suffer from chronic malnutrition, according to the United Nations. Although public schools are free, children must pay for supplies, food and transportation. Many families calculate that every day in school is a day less of work, a meal not put on the table. Without schooling, most of those children will not be able to climb out of the poverty that is keeping them from class. Roberto looks like the exception that proves the rule, the kid who seems to be able to handle it all. He is good at work, successful at school and a decent defender in soccer, thanks to his size and strength. His teacher says he gets almost perfect grades, and in a country where only one in four children finishes secondary school, Roberto says he wants to study to be a lawyer so he might one day "defend the good people against the bad people." His is a lofty goal in a country where only 7 percent earn a university degree. But that doesn't worry Roberto as, days later, he crosses a four-lane highway to reach the field where he plays soccer with his friends and coach. There, between matches, he talks about the adventures of Huckleberry Finn, a book given to him by his boss at the repair shop, and talks about the luxury that work affords him: buying his mother a chicken for Christmas dinner. "Don't ruin the surprise," he said. Text from the AP news story, Poverty, violence push Honduran children to work, by Alberto Arce.